Coptic monasteries and moulids, the celebrations of saints that bring hundreds of thousands of pilgrims and visitors to holy sites across Egypt, are usually overflowing during the summer. But this year, they are almost empty, thanks to the decision made by Egyptian churches to cancel all church trips and conferences. 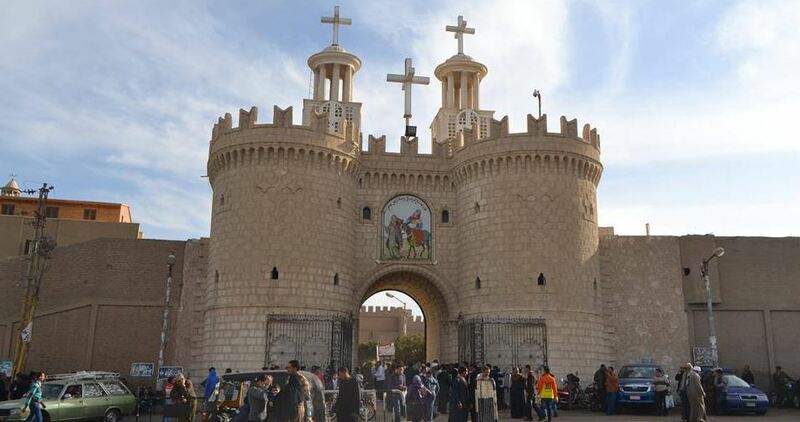 The decision, made following security instructions issued in fear of Copts becoming the targets of even more terrorist attacks, has cast a long shadow on church activities, as well as on the resources of many monasteries and their ability to meet their needs. According to church officials, the decision to cancel most church activities was made after close collaboration between the various churches and the country’s security services. The heads of all three churches—Coptic Orthodox, Catholic, and Protestant—all received strict instructions not to launch any activities that require travel, including trips to monasteries or conferences in coastal areas, pushing all churches to jointly and immediately make the decision. The Deir al-Muharraq monastery in al-Qusiyyah in the south of Egypt, where daily religious celebrations are held for 26 days ending August 26, had to force visitors to leave and canceled the reservations of pilgrims who usually spend many days there, fulfilling vows, giving donations, and attending concentrated religious rites and prayers. Beyond that, a number of monasteries put in place numerous strict requirements for accepting Coptic visitors, whether individually or in groups, including opening the monasteries on specific days for short periods of time, and receiving prior approval for visits. Summer vacation is the Egyptian church’s most active season of the year, and that holds true for the Orthodox, Catholic, and Protestant churches. Churches go all-out in setting up spiritual, educational, and recreational events and activities to attract the church’s youth. This includes organizing conferences and competitions in coastal or religiously relevant areas such as Alexandria, Port Said, the Red Sea governorate, and Wadi al-Natroun. This is all in addition to the trips Copts organize through Christian-owned travel agencies to both monasteries and summer resorts. The church is looking after the lives and wellbeing of Copts in light of the circumstances Egypt is going through. Therefore, this decision is to the benefit of Copts. It will also allow the security services to fight terrorist groups and stop any attempts to target Copts, especially because terrorist groups have been updating their methods and attacks on Egyptians. This decision is irrelevant to the church’s primary role of providing spiritual services and daily religious practices inside church premises. It is rather related to outside conferences, trips, and activities, and therefore doesn’t affect freedom of religion. Obedience of the decisions made by religious leaders is required. The argument of those who oppose the decision is that it is unprecedented, even during the 1980s and 1990s, when there were violent attacks on Copts and their property. They also stated their concern that the decision will be continued indefinitely to limit the movement of Copts in the public sphere and the activities carried out by churches. Before addressing the decision, the possibility of its continuation, and whether it actually limits terrorist attacks targeting Copts, it is important to review the general atmosphere that has allowed for the expansion of the church’s social role ever since the time of Anwar al-Sadat. In the 1970s, the role of Islamic groups in society was growing, enforcing conservative norms in clothing, behavior, and activities, spreading into universities, unions, and sports clubs, all while state organizations were becoming more and more discriminatory against Copts. As a result, Copts started retreating into church as they were being pushed out of the public sphere. At that time, the Egyptian church started to play a growing social role away from its original spiritual and educational purpose. Churches organized recreational activities, sports competitions, and summer trips alongside their spiritual activities. This served a dual purpose: keeping Copts away from the reach of Islamic groups and supporting them socially by providing a break to compensate for the government’s absence and weakness, especially in areas far from Cairo. With time, this role kept growing for numerous reasons. Some of these reasons have to do with the Copts themselves, who kept to that space away from the discrimination and harassment of society. It was also a cheaper community to be part of during tough economic times, and allowed them to express themselves as a minority in interacting with society. Other reasons pertain to religious leaders, whose role and control over Copts grew through the various services they provided. Yet other reasons were due to the state institutions, which supported and allowed the growing role of the church and religious leaders in exchange for Copts staying silent on full citizenship rights and protection from discrimination. The state also used the clergy’s ability to bring together crowds for elections in support of favored candidates. On another hand, this expansion of the church’s role was criticized by Islamic groups that saw the church playing roles other than its spiritual one. When security services harassed Islamic groups, their retort was that churches were open all the time while mosques were only allowed to open for prayers, and churches provided activities while the role of mosques was strictly limited to prayers, except for a few mosques that were allowed to host lessons by approved scholars. The church’s growing role created a whole economic ecosystem for Copts and the church, including visits, conferences, and recreational activities. This ecosystem led to the creation of transportation companies, tourism agencies, hotels, lodgings, and other recreational spaces, in addition to outlets that sold food products and stationery in monasteries. Even though the expansion of the role of the church increased the isolation of Christians and their limits behind church walls, and led to them being dealt with as a religious bloc as opposed to full citizens, it also resolved some of the issues in the relationship between the state and the Coptic community. First and foremost, the decision to stop all religious trips and conferences violates the freedom of religion and belief by imposing strict limitations on Coptic religious visits and church activities and the holding of meetings, especially given that visiting monasteries, receiving the blessings of the saints, and fulfilling vows has become a crucial part of Coptic religious culture. The decision also violates the freedom of movement and choosing a space for residence and activities for a specific group of Egyptians. The decision also carries a number of economic repercussions. First, monasteries will be affected by decreasing donations, vows, and sales—important sources of church finances used to cover the costs of various activities in light of the absence of support from the state. A large swath of Copts whose livelihood depends on church conferences and trips will also be negatively affected. Continuing to abide by this decision also means that Copts will be deprived of some basic and recreational services and that their role in the public sphere will decrease, making the issue they face even worse. This is especially true since the state has not resolved the root issues for religious discrimination, either officially or socially. Finally, the continuation of this decision sends a negative message that terrorist organizations have succeeded in spreading fear among Copts, leading to the limitation of church activities and movement. This amounts to a declaration of the failure of security plans and choosing the easy way out when confronting terrorism. It would have been possible to advise Copts to voluntarily decrease the number of trips rather than banning them outright, and security services could have put in place plans that would help anticipate attacks, or at least provide security procedures that match the extent of church activities in the summer season. With the cancellation of these activities, terrorist groups can now target Coptic gatherings outside of churches across Egypt. The main goal should be ensuring citizens that state is able to protect them and their institutions and stop terrorist attacks before they happen. Therefore, the state and churches should proactively reverse this decision, allowing citizens the freedom to visit religious sites whenever they see fit, and the state should fulfill its constitutional and legal obligation of providing security for individuals and places of worship. Not doing so sends a message to terrorists that they have won—that they succeeded in depriving Christian citizens of their ability to worship and practice their religion, and that the state is unable or unwilling to take measures to fully protect them. This could, in turn, put Egypt’s Christians in even more danger.